(Tampa, FL) The USF football team will open its third season under head coach Charlie Strong with a primetime clash vs. Wisconsin on Friday, Aug. 30 nationally televised on an ESPN network from Raymond James Stadium. The American Athletic Conference announced the 2019 schedules for all 12 conference teams on Thursday. USF returns to conference action with back-to-back road games. The Bulls will travel to Navy on Sat., Oct. 19 for a game televised on CBS Sports Network and then head to ECU on Sat. Oct. 26 as conference play heats up. USF will get its second bye of the season before a strong closing slate against teams that posted a combined conference record of 26-6 last year. 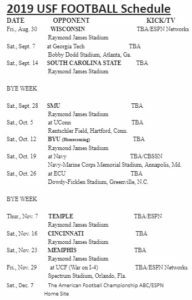 The Bulls will get the first three of those games at home starting with a Thurs., Nov. 7 primetime game vs. Temple on ESPN. USF fell to 2-3 vs. the Owls after a 27-17 loss in Philadelphia last year as Temple went 7-1 in the conference and finished second in the East Division. The Bulls beat Temple, 43-7, in 2017 in a Thursday primetime clash in Raymond James Stadium. (Tampa, FL) Safety Jake Gervase made an interception in the end zone to help preserve a late lead, and ball-hawking Iowa Hawkeyes beat No. 18 Mississippi State in the Outback Bowl 27-22 Tuesday. First Easley slipped several yards behind the secondary to catch Stanley’s long throw in stride. The touchdown pass was the 50th of Stanley’s career — and his longest. It was the longest play allowed by the Bulldogs this season. With fifth-year senior Fitzgerald departing, the Bulldogs will have a new starting quarterback — possibly Thompson — when they open the 2019 season Aug. 31 in New Orleans against Louisiana. (Tampa, FL) The Iowa Hawkeyes and No. 18 Mississippi State Bulldogs will square-off for the first time in the Outback Bowl on New Year’s Day in Tampa, bowl officials announced Sunday. Both teams are 8-4. It will be the first time these teams have played in 119+ seasons of their football history. It will also be the first appearance by Mississippi State in the Outback Bowl. 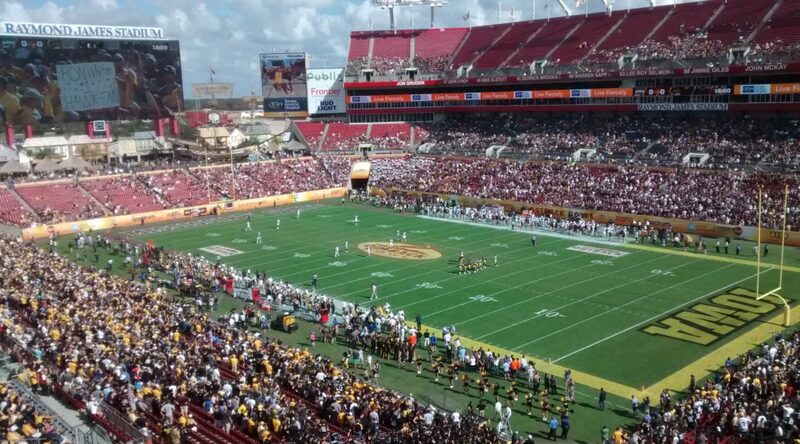 The Outback Bowl will be played on January 1st at 12:00 PM ET at Raymond James Stadium. For information on Outback Bowl events leading up to the game go to the bowl web site at www.outbackbowl.com. 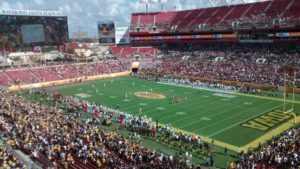 (Tampa, FL) The USF Bulls regular season came to a merciful close Saturday afternoon with a 38-10 loss to cross-state rival UCF at Raymond James Stadium. After winning their first seven games, the Bulls dropped five in a row to end the 2018 campaign on a sour note. While UCF kept its 24-game winning streak alive, it came a tremendous cost when quarterback McKenzie Milton left the game early in the second quarter with a gruesome leg injury that required emergency surgery at nearby Tampa General Hospital. Reports are as of Sunday November 25, that the surgery was successful, but no further details have been released on his status. The lone bright spot for USF was Freshman Johnny Ford rushing for 120 yards and 34-yard touchdown reception late in the third quarter. Ford averaged 7.5 yards on 16 carries in his third 100-yard rushing game of the season. His first career touchdown reception came on a pass by sophomore starter Chris Oladokun with 1:15 left in the third quarter before UCF responded with 21 straight points. USF (7-5, 3-5 in AAC) saw its War on I-4 series lead trimmed to 6-4 as UCF (11-0, 8-0 in AAC) claimed its second straight win in the series. Starting for the second time in place of injured Blake Barnett, Oladokun completed seven of 12 passes for 77 yards and opened the game’s first drive with a 22-yard run. Junior Brett Kean also saw action, completing eight of 17 attempts for 36 yards. Defensively, USF stayed within striking distance most of the way by forcing six punts, including four in the second half. Linebacker Khalid McGee made a game-high 13 tackles, becoming the 15th player in program history to record 100 stops in a season, after he and 17 other seniors were honored in their final regular season game at Raymond James Stadium. The 10th War on I-4 clash started with teams trading punts and takeaways on defense, including a 30-yard interception return by Nick Roberts down to the UCF 12. After the Bulls couldn’t convert on fourth-and-1 from the UCF 3, the Knights drove 97 yards and took a 7-0 lead with 25 seconds remaining in the first quarter. UCF extended its advantage to 10-0 four minutes into the second quarter, one play after star quarterback McKenzie Milton was carted off the field with a devastating leg injury that caused both teams to surround him with support. Trailing 17-0, USF chipped away at its deficit with a 25-yard field goal by Coby Weiss with 3:09 remaining in the half. Ford rushed three times for 67 yards on the 70-yard scoring drive and his 38-yard run set the Bulls up at the UCF 13. Ford finished the first half with 76 yards on seven attempts (10.9 ypc). Friday’s second half opened with five straight punts before Oladokun found Ford over the middle for a 34-yard touchdown with 1:15 left in the third quarter. UCF responded with a touchdown on the next drive and capped off the scoring with 14 more points in the fourth quarter. Announced attendance was 57,626 for the 10th playing of the War on I-4 marked the second-largest crowd in the game’s history. Prior to kickoff, USF honored 18 seniors: WR Ryeshene Bronson, WR LaDarion McBride, OL Eric Mayes, WR Tyre McCants, TE Riley Sheehan, RB Davion Sutton, K Jake Vivonetto, DB Chris Barr, DT Kevin Bronson, DE Josh Black, DE Juwuan Brown, LB Jeffery Farrar, DE Derek Hintze, DB Ronnie Hoggins, DE Vincent Jackson, LB Khalid McGee, S Jaymon Thomas and DB Mazzi Wilkins. Despite the loss, USF’s 7 wins qualifies them for a bowl bid which will be awarded December 1. (TAMPA, FL) With few lower bowl seats remaining and demand running high for the War on I-4 gridiron clash vs. unbeaten UCF on Friday, Nov. 23, USF Athletics has released tickets for purchase in the west upper deck (home side) of Raymond James Stadium. USF Athletics also announced a new partnership with Dunkin’ as the presenting sponsor of this year’s game. The stadium’s 44,204 lower bowl seats and suite tickets have nearly sold-out for the game, with less than 700 prime seats remaining in various, dynamically-priced lower bowl sections. Upper deck tickets will begin priced between $29-$59. USF leads the War on I-4 series, 6-3, and has won two of the last three meetings, but the Knights claimed a 49-42 victory in Orlando last season in a game that saw three touchdowns scored in the final 2:21. USF tied the game on an 83-yard touchdown pass from Quinton Flowers to Darnell Salomon with 1:41 left to play, but the Knights got a game-winning 95-yard kickoff return from Mike Hughes. Senior Tyre McCants, the Bulls’ leading receiver in 2018, had a USF game record 227 yards receiving and a touchdown on nine catches in last season’s War on I-4 clash. The team’s combined to produce 1,186 yards of offense in the game. (Tampa, FL) The USF Bulls will open their sixth season in The American Athletic Conference Saturday night vs. ECU, a team USF is 7-1 against all-time and has won three straight games against, including a 61-31 victory in Greenville in USF’s second AAC game last year. The Bulls are 4-1 in AAC openers, having won their last two. This will mark USF’s fifth AAC opener played at home, the Bulls are 3-1 in those games with a loss to Memphis (24-17) in 2015. USF is 9-6 all-time in conference openers. A win would mark USF’s second straight 4-0 start to a season (USF started 7-0 in 2017) and the seventh in program history. PROGRAM WIN 150: USF is seeking the 150th win in program history in just its 22nd season. The Bulls will try to reach the mark in program game 255 (149-105, .586), which would be the fastest of any FBS program in the state of Florida to reach the mark. The next closest is Florida in 258 games. USF has gone 24-4 since the start of 2016. AMERICAN ROLL: USF is 19-5 in AAC games over the last three seasons, the best record in the conference, and has won 10 of its last 11 AAC home games, with the loss coming to Houston (28-24) in the final 11 seconds last year. The Bulls have won seven straight home games vs. AAC East Division foes, with the last loss coming in 2014. The Bulls are 13-2 vs. East Division foes the last three years (losses at UCF (2017) and at Temple (2016) and 16-6 overall. HOME COOKING: USF has won 18 of its last 21 home games, with 15 wins coming by two touchdowns or more. EXTRA YARD FOR TEACHERS: USF will sport helmet decals in support of Extra Yard for Teachers. The CFP Foundation is spearheading the charge towards elevating the teaching profession using the high profile of college football through the implementation of four focus areas: resources, recognition, recruitment and professional development. Six different players scored touchdowns in USF’s most explosive game of the 2017 season, a 61-31 victory at East Carolina hat marked the Bulls’ most points ever in a road game. It was USF’s second-highest scoring game in American Athletic Conference play. USF rushed for a season-high 390 yards and totaled 575 total yards. USF had a highly productive 21-point first quarter and held ECU to just seven second half points while running off 24 unanswered to cruise to the win. Quinton Flowers passed Tim Tebow to become the state of Florida’s top career rushing FBS quarterback and posted 93 yards and a touchdown on just 10 carries. Flowers added two touchdown passes during his 253-yard day.